Women represent less than 10% of developers worldwide, at least in most developed countries (which are those with the worst figures when it comes to gender equality in IT by the way!). In app development, it’s even worse : when Technovation was founded 6 years ago, they estimated that only 4% of app developers were women. 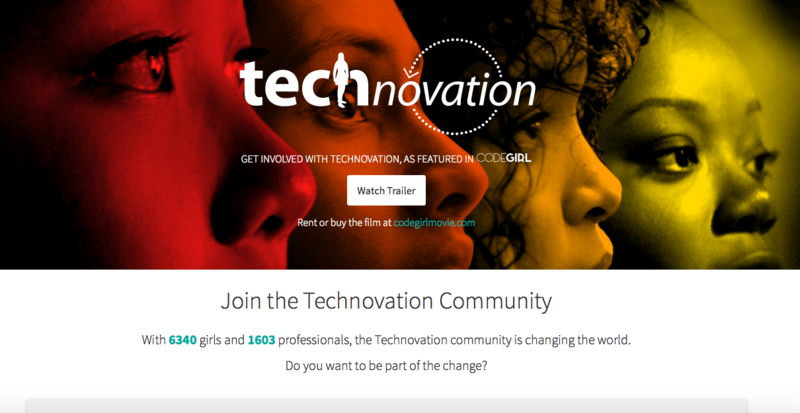 Technovation is today the largest international tech challenge for girls, and has built the largest pool of young women who know how to start a tech business. Focused on high-school girls, the challenge is very ambitious and the results are all the more impressive ! Participants are teams of high-school girls, so let’s say they are between 15 and 18 years old in average. They have 3 months, not one day more, to build a mobile app solving a community problem, and have to do this by starting totally from scratch. The challenge is in English, to add but a difficulty to the situation. The winning teams gets 10 000$ to develop their project in the real world. Each team is supported by a mentor, often one of their teachers and not a tech person or an app developer. The « Code Girl » documentary followed a few teams during last year’s challenge, through the ups and downs, the joy of being selected and the sadness of not making it till the end. I had the opportunity to watch the movie on YouTube when it was released, and I was properly impressed by all the girls, from the winning Nigerian team to Moldavia or a few American cities as well. The issues they tackle are very serious, from the identification of contaminated water to save lives, to helping disabled people with paying their errands, and it’s interesting to see how the challenge, by allowing them to create something tangible and useful, transforms them quietly but surely into engaged actors who have the tools and capabilities to deliver on their ideas. That is probably a very powerful aspect of teaching girls, and adolescents, to code : when associated with meaningful objectives, it is a very positive way of including them and associating them to the society of adults and elder people, at an age when they would naturally rather tend to isolate themselves from it, even reject it. And when they manage to solve adults’ problems, what a brilliant turnaround!